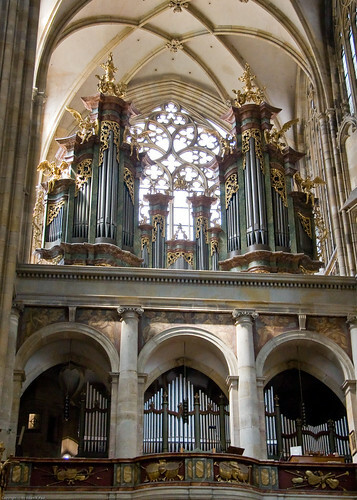 With Gothic arches soaring high overhead, stained glass windows galore, and several notable tombs, there is plenty to keep the eyes occupied as you walk around this large church. 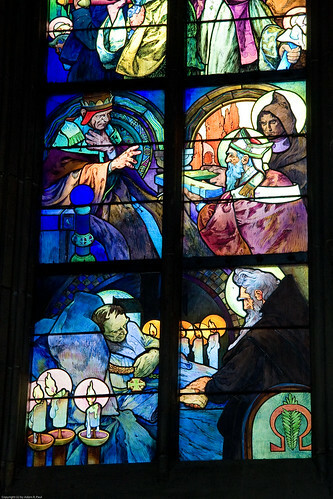 Although most, if not all, of the stained glass is from circa 1900, it’s of very high quality. 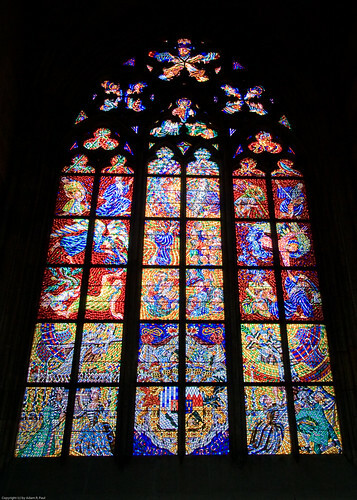 Because construction of the cathedral took over 400 years and funds were tight near its completion, many of the glass panels bear the names of their sponsors – banks, insurance companies, and the like. 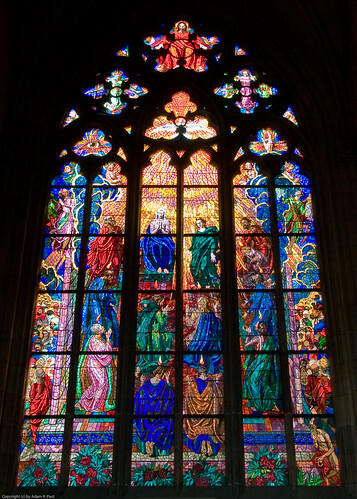 The color schemes of the windows are different than most I’ve seen, with strong reds, blues and sometimes greens dominating. 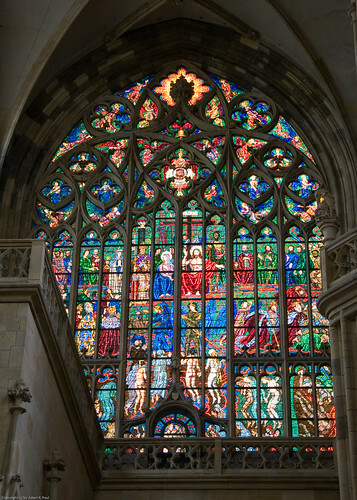 The detailing of the glass is superb – I can’t even imagine how many individual glass pieces there are in the window above! 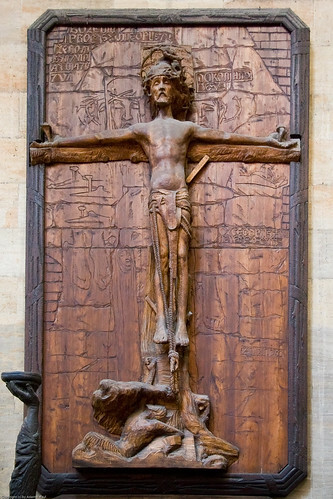 His soaring panel exemplifies the Art Nouveau decorative style, with its natural themes, bold yet soft colors, and mixture of straight and organic lines. 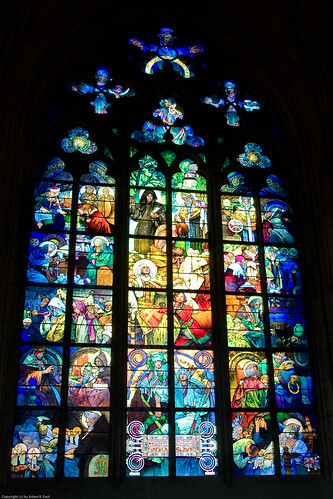 In addition to the windows, carvings and reliefs are everywhere. 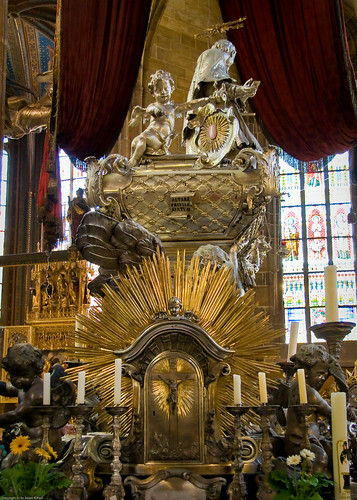 Impossible to miss, in the middle of the walkway around the altar area, is the enormous, solid silver tomb of St. John of Nepomuk. 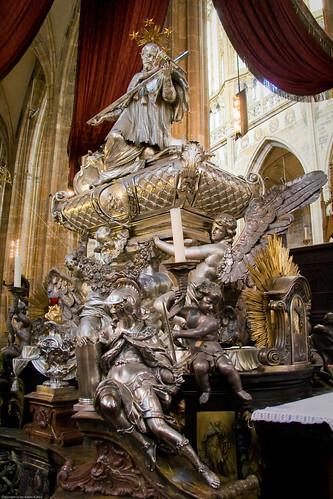 This gargantuan sarcophagus, made from two tons of solid silver, makes up in fanciness what it lacks in subtlety. 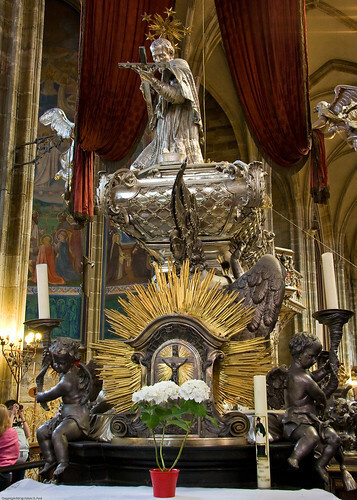 An ersatz Catholic Czech equivalent of the martyred Jan Hus, it seems no expense was spared in the church’s attempt to make him the Catholic patron saint of the Czechs. 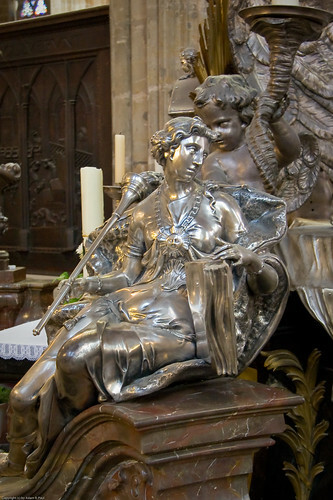 While walking around the tomb, look down, as many notable early Czech saints are interred or memorialized here as well. 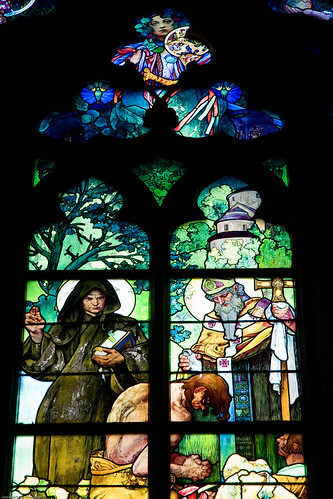 Also fascinating is the Chapel of St. Wenceslaus (1344-64), which is not open to the public, but one can get views of it from the adjoining rooms. 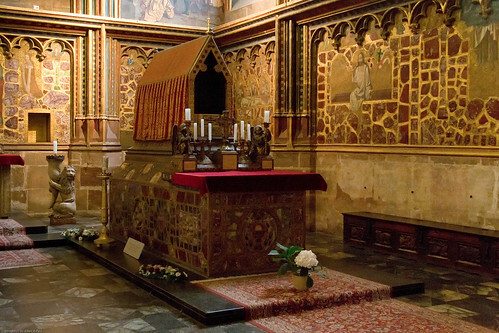 This fine chapel has walls adorned with semi-precious stones, and contains the relics of St. Wenceslaus, the “Good King” of the Christmas carol. 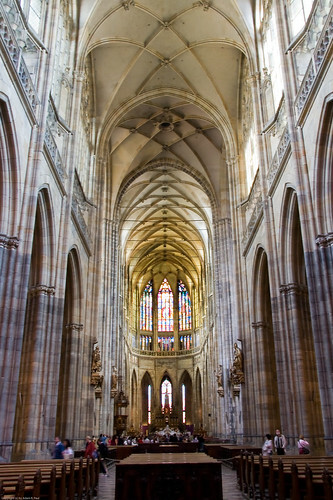 Despite my general dislike of highly-touristed areas, it would be unthinkable to visit Prague without seeing St. Vitus Cathedral – it’s a masterpiece of architecture, glasswork, and culture, and should be on anyone’s itinerary. 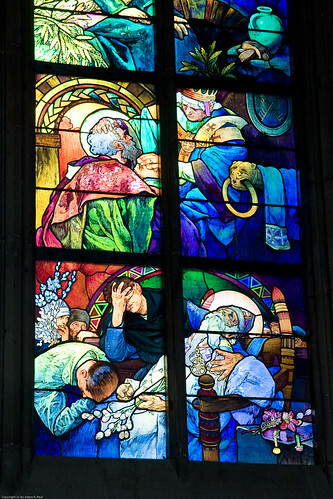 Oh, that’s cool — I knew I had seen them before — the fourth shot of Alfons Mucha’s stained glass — the two women — were copied for Cafe Prague’s window. A fine choice, but apparently not enough for Cafe Prague to stay in business – AFAIK they’ve closed. 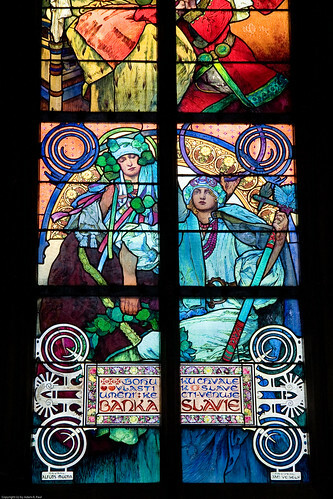 I have a question about the Mucha window in St Vitus Cathedral. 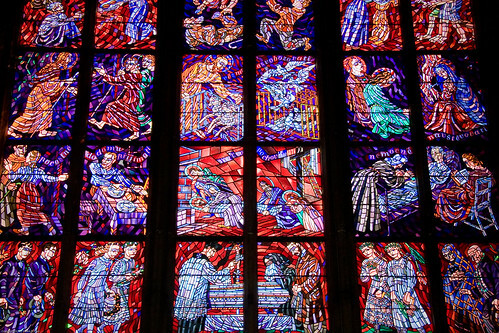 I have searched high and low for descriptive notes for each of the panes. 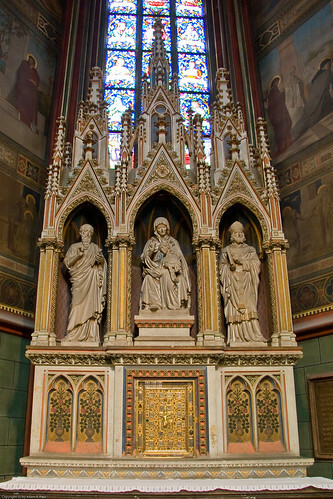 I know that they all have something to do with SS Cyril and Methodius. But I would like to know something more about each section of the window.